Hope you are well? We wanted to write and thank you for our wonderful stay at Jasmine Lodge. Tracey and I stayed late October/early November. She stayed for two weeks and I stayed for one week. Jasmine Lodge is the best hostel we have ever stayed in.Sincerely, Mr. Kay. We stayed at the jasmine lodge in March this year and found the staff were very pleasent and beneficial in looking after us at the lodge.Myself and friend Angry cant thank Chinn enough for taking us out to eat the local Kemher food and experiencing the local musicians at the restraunt.Also Mr Kunn runs a very clean and efficent lodge that offers alot to the tourist.I cant wait to visit Cambodia again and stay there as it was extremely good value in price in what it offered.What i say all staff make you feel welcome like it is their home. We have a great time at Jasmine Lodge. Thanks to Mr Kunn, Mr Ya and his friend. Good work, keep it up. It is a really nice place with clean, large and cheap rooms. The restaurant is great with free access to the pool table. If you go, ask for Mr Smey the best tuk-tuk driver in town! 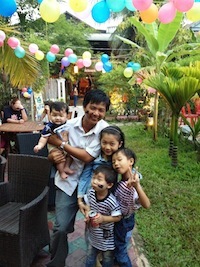 We had an incredible time with him around Angkor! I spent three months at Jasmine Lodge and enjoyed every moment: excellent food, clean, comfortable and inexpensive rooms and obliging, keen staff with a generous sense of humour. The staff make the place special. It was like staying with friends. I have stayed in Jasmine Lodge for 7 weeks now and I could not recommend it with more conviction. During my stay I have felt not like a guest but a part of the family and have been treated with all the respect and consideration as if I were a visiting cousin. With reasonable rooms, excellent food and trustworthy staff that go above and beyond the expectations of a 5 star hotel Jasmine lodge receives my recommendation for any visitor in the Siem Reap area. Nice place, people were friendly. Nice leisure area up stairs were its good to meet people & chat. Friendly staff, friendly boss, clean room, good service. Breakfast is good. Worth every cent! 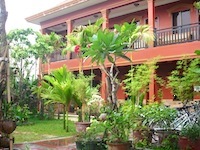 Will definitely stay at Jasmine Lodge for our next Siem Reap trip!